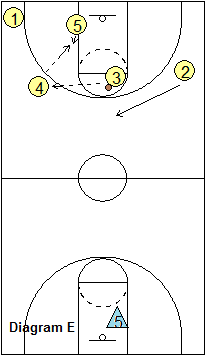 This is a good full-court drill that emphasizes transition offense and defense as well as conditioning. 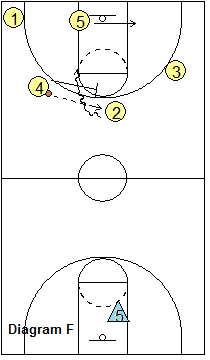 Offensive hi-lo and pick-and-roll or pick-and-pop are also drilled, as the defense works hard with intense pressure in a diamond half-court set. We have two teams, and we keep score with losers running or doing pushups at the end. Defense. See the diagrams below. Diagram A shows the defense in blue. Since this is a 5-on-4 drill (5 offensive and 4 defensive players), our X5 player on the blue (defensive) team stays back under the basket, like we used to call a "cherry-picker". The other four defenders have sprinted up the court and play a very aggressive diamond zone. We want intense ball-pressure and trapping along the baseline or whenever possible on a wing. X1 picks the up ball at half-court, aggressively pressuring the ball. Players must really hustle, scramble and rotate, and communicate. On a rebound, turnover and change in possession, they quickly advance the ball up the court, looking for the long pass to X5. This means that the offensive guards must be looking to sprint back as soon as a shot goes up. Offense. 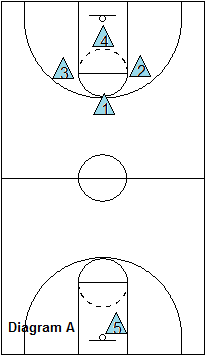 Diagram B shows the offensive set after we quickly transition up the court, looking at all times for the fast break. For sake of clarity, we are not showing the blue defensive team in these diagrams, but they will be there, playing their diamond scramble defense. If it is there, always look to pass long up the court to O5 (our "cherry picker"). Long passing up makes the defense run hard to get back to defend. Our wings O2 and O3 run wide to maintain spacing. O1 looks to attack the hoop off the dribble. If stopped and he/she passes to the wing O2, O1 then cuts through to the opposite corner. Our trailer O4 fills the top spot and could get a return pass from O2 (diagram C). On seeing this, O5 posts up hard inside for a quick hi-lo pass from O4. 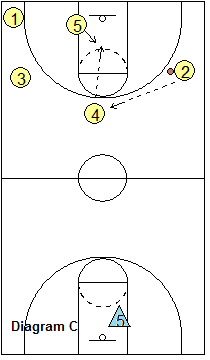 If the inside pass is not there, O4 might pass to O3 and then follow the pass with a pick and roll, or pick and pop (diagram D). If O3 passes back to O4 on the perimeter (diagram E), O5 posts up again, looking for the pass from O4. Any time O4 receives a pass on the perimeter, O5 posts up for the hi-lo pass. 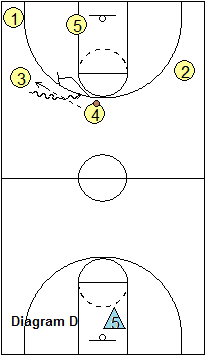 If the hi-lo pass is not open, O4 then passes and runs a pick and roll or pick and pop (diagram F). 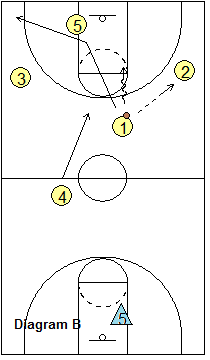 You might like to change the half-court offense described above to whatever your favorite offense is. For example, if you like to run the Read and React offense, just flow into that offense instead, once your fast-break and transition offense has been stopped. So you can see that with this drill, we are not only working in transition offense and defense and conditioning, but are also running some basic half-court offense, and are working hard on defense to apply pressure, scramble, rotate and communicate (like a 5-on-4 shell drill).